with this capable Durango Limited crossover. Shop for a larger sport utility vehicle and you’ll soon find that the market is now dominated by crossovers. These are models that dispense with traditional body-on-frame or truck-like construction in favor of unibody or car-like construction, the latter providing a more rigid frame for a better handling ride. This newer breed of SUVs include models that have made the transition from the old layout to the new style, vehicles such as the Dodge Durango, Nissan Pathfinder, and the Ford Explorer. 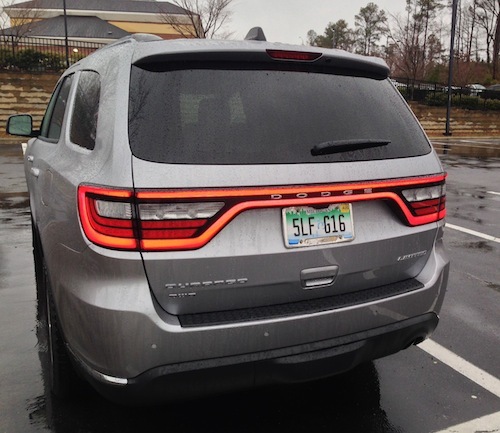 The Dodge Durango’s transition to its current platform was made in 2011, arriving after a one model year break. The earlier body-on-frame editions were sold from 1998 to 2009. Now in its fourth year, this third generation model has received a mid cycle product update. In 2013, Durango sales rose by 43 percent over the previous model year, with 60,727 units sold. The Durango is built on the same platform underpinning the Jeep Grand Cherokee, but its wheelbase has been stretched by five inches and its overall length by nearly a foot. The Dodge isn’t a midsize SUV nor is it a full-size vehicle along the lines of a Chevrolet Tahoe, rather it serves a sweet spot that should appeal to many shoppers. And that sweet spot comes in the form of an attractive body with a sporty face, employing the same level of ruggedness found on the Dodge Charger. Dodges current design language features a crosshairs grille and in the Durango that grille is flanked by available Bi-Xenon headlamps. A larger air intake is itself flanked by fog lights set within sculpted recesses. Additional sport styling is apparent on its wide hood and across its profile, the latter with belt line sculpting and rocker panel trim. Its large wheel arches accommodate big wheels, available in a variety of sizes and styles. Bringing up the rear is another Dodge design feature: a racetrack taillight layout added just this year, part of a broader mid product cycle refresh. 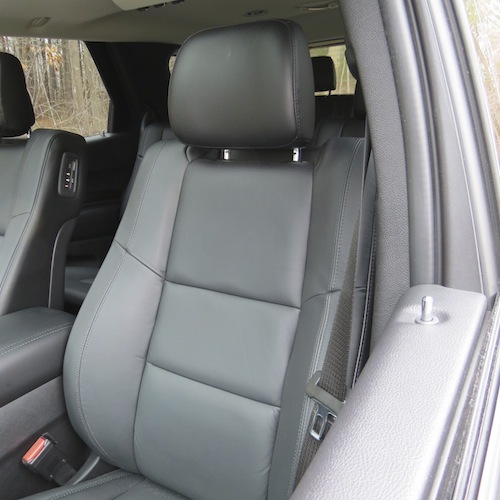 Inside, seating is for seven or in the case of the tested Durango Limited it seats six. That loss of seating comes with a nice benefit as the second row three-place bench seat is replaced with a pair of captains chairs, offering comfort rivaling the front row bucket seats. That third row seat can accommodate two passengers and provides ample leg room, but as my teen son told me, the seat backs are hard. Blame that on making a seat just thin enough to fold flat when expanding the storage area. Back support, evidently, has taken a hit. Its third-row seating weakness aside, the Durango’s interior strength lies across its brightly lit and sensibly designed dashboard. All five Durango models are outfitted with a premium instrument cluster with tachometer, offering a sharply contrasting and easy-to-read display. Both the SXT ($29,795) and the SXT Plus ($31,495) are outfitted with cloth low-back bucket seats with manual adjustment in the SXT only. The Limited ($35,995) brings in leather-trimmed buckets seats, heated across the first two rows. 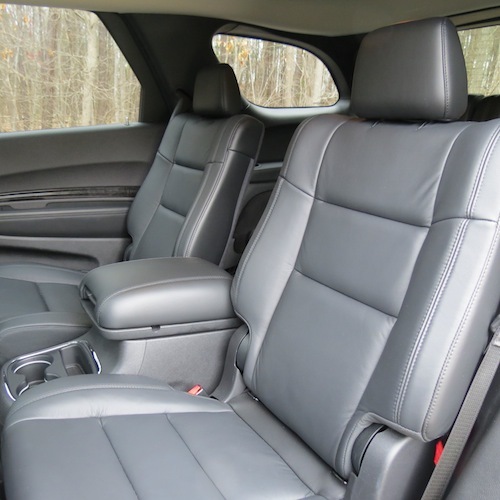 The Durango R/T ($38,995) has sport-trimmed leather seats, while the top-of-the-line Citadel ($40,995) is outfitted with the Durango’s highest quality leather materials. As equipped, the Limiteds driver seat features eight-way power adjustment. A tilt and telescopic steering wheel column and a heated steering wheel are also included with the Limited. 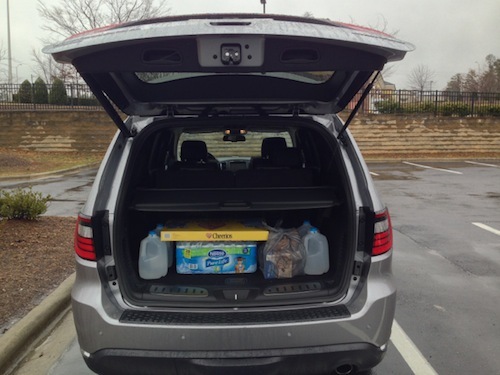 Like other crossovers, the Dodge Durango Limited provides generous amounts of storage with various in-door pockets, an overhead console, a deep glove box, a stacked center console, and beverage holders. A Premium Group ($2,395) brought in a number of goodies including SiriusXM traffic and travel alerts, a 506-watt 9-speaker audio system, HD radio, power sunroof, navigation, and a power liftgate. A Rear DVD entertainment system ($1,995) brought in a Blu-Ray compatible video system with dual screens located on the back of the front seat head rests. Other goodies that brought the Durango Limiteds final price up to $47,165 included a trailer tow package ($995); a security, safety and convenience group ($1,195) with Bi-Xenon headlamps, covered storage compartment with hooks, a cargo net, and blind spot detection with rear cross traffic alert. Another $895 upgrade gave you the captains chairs while $300 brought in a second row console with an armrest, storage, a USB charging port, and a 12-volt outlet. One thing about most larger crossovers is that the list of amenities is typically exhaustive. It is also exhausting to recall them all. The memory makers from the drivers perspective include the following: excellent sight lines; plush but supportive seats; a generously padded steering wheel; a smartly laid out instrument panel; and very important: a colorful and fairly easy to configure infotainment system. By default, I typically use my own smartphone-driven navigation and other helps, but with UConnect you have a system that wont have you yelling in frustration or, worse, looking at it for too long to find it a distraction. All SXT, STX Plus and Limited editions are powered by a 3.6-liter V-6 making 290 horsepower at 6,400 rpm and 260 foot-pounds of torque at 4,800 rpm. Rear-wheel drive is standard and all models are paired with an eight-speed automatic transmission. Full-time all-wheel drive is standard with the Limited, while four-wheel drive with low-range gearing comes with the V-8. Speaking of a V-8, that 5.7-liter HEMI engine is available with the Limited and Citadel, and is standard with the R/T. This engine makes 360 horsepower at 5,150 rpm and 390 foot-pounds of torque at 4,250 rpm. It is the engine of choice for people that want maximum power and towing capabilities although the 6,200-pound towing capacity of the V-6 is quite good. With the V-8, you can pull up to 7,400 pounds. With the larger engine you will also see your fuel mileage drop by an average of 3 mpg over correspondingly equipped V-6 Durangos. From a full stop and up to highway speeds, the Durango V-6 gets right down to business. The transmission shifts smoothly through all forward gears and the crossover handled all road abrasions with ease. Handling itself is on par with other models Ive tested with the lone exception being the ridiculously fun Jeep Grand Cherokee SRT8. Ah, but were talking Dodge here, not a $70,000 Jeep. Ive often been asked by friends about various features you can get in vehicles that they are considering. Usually, that discussion helps them make a distinction between the amenities they must have and those that would be nice to have, but may bust their budgets. The security of all-wheel-drive is important to many people, precisely where the Limited delivers. Quite easily, however, many of the amenities that people want add upwards of $10,000 to the sticker price, requiring buyers to align their expectations with their budgets. So, if you want a crossover in this class that comes well equipped, your starting point is about $40,000 and can push up toward $50,000 when all is said and done. Fortunately for Dodge shoppers you also have two other people haulers that offer excellent value in the form of the Dodge Grand Caravan (minivan) and Dodge Journey (crossover) at far lower price points. 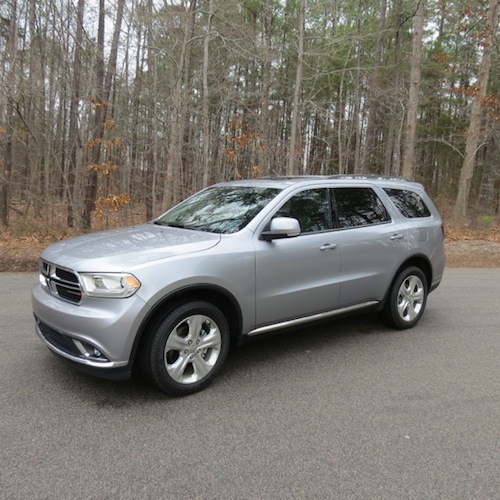 They’re both much different vehicles than the Durango, but are just the sort of compromises that can keep you in the Dodge family. 2014 Toyota Corolla: Best Bang for the Buck? 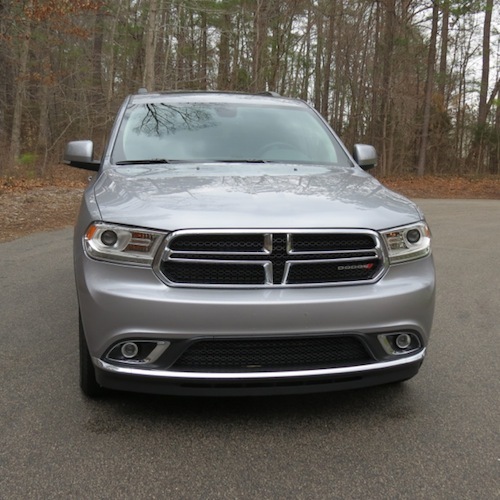 2014 Dodge Durango Limited photos copyright Auto Trends Magazine.